I know, it’s rather obvious, but you’ll need a dense kind, one that won’t break easily; African Padauk is a great example and it has a very manly, deep red colour that exudes masculinity. So once you’ve tracked down a few pieces of good wood, you can make your measurements for a few blocks of ring blanks according to your preferences. Make sure the wood grain runs across the block and not through it, as that will likely cause it to crack. Whether you have a scroll saw, hacksaw or band saw, you are going to have to use some sort of saw to cut out the blanks without cracking the wood. 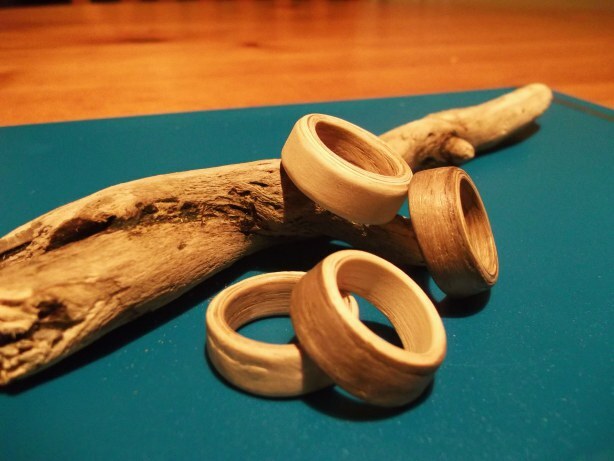 If you don’t trust your skills yet, cut out a few banks so that you have extras in case you accidently crack one or two; trial and error is key with your first attempts at making wooden rings for men. Take my advice though and cut the blanks along the grain so that you don’t weaken the wood. Your next step will be to drill a hole in the middle of your blanks. You will have to measure the diameter of your ring finger and then find an appropriate drill bit for wood that is slightly smaller than your finger’s diameter. It has to be smaller to begin with because once the hole is drilled you need to sand the inside of the wooden rings for men down a bit to smooth it out. Cordless power drills are awesome and not having to worry about the cord is an advantage, but a good corded drill works just as well. Put the ring blank in the vice with the grain across the way to ensure that the pressure is taken evenly across the block of wood. Be sure to start in the center of the block and firmly press the drill bit down while drilling, without putting too much pressure on the wood; wiggle the drill back & forth a bit if you think it is necessary, because if you’ve chosen a proper kind of wood, it’ll be harder than you thought. Don’t drill all the way through, as you will most likely chip the bottom part of the wood that way, so drill halfway and turn the wood over before drilling through it entirely. Now that the blank is starting to resemble something that looks like wooden rings for men, you’re getting somewhere… A Dremel tool will be ideal for your next step; you want to sand down the rough edges inside the ring and taper it a bit until it fits snugly over your finger. Remember that you don’t want to force any ring over your knuckle – it should slide over easily and sit comfortably. If you’re planning on making a lot of wooden rings for men, you should invest in one of these; belt sanders can save you a lot of time with the next step, otherwise you’re going to do a lot of sanding with 100 or 120 grit sandpaper. You can decide how thick and how broad you want your ring to be then you need to draw a ring around the hole according to your desired thickness on one side of the ring so that you don’t sand it too thin. A scribe would also work well if you like to be precise. Cut the corners off of the ring to save you some time trying to sand them down, then sand the ring down to your preferred size and remember to bevel it a bit on both sides. You’re probably so proud of your creation by now that you think it is perfect, but you can go a step further and enhance its strength by using a heat gun or some other heat source. You want to make sure that you don’t burn the ring as that would make it brittle, but you should heat it up enough to let it smoke a little. A bit of darkening on the sides is also not necessarily a bad thing and it will look rugged as well. This process can shrink it a bit, so use your Dremel tool again to resize it. You should also consider having a bit of Tung oil handy to dunk it in after heating it; this will cool it down and the oil will give it a nice finish, soaking into the pores yet keeping the wood’s natural colour and grain visible. 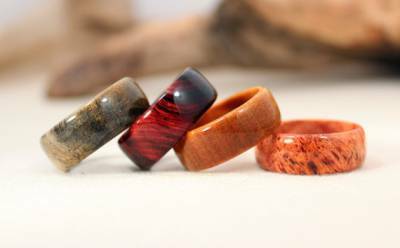 If you’ve enjoyed making a few good looking wooden rings, you can take it to the next level and try to combine different colour woods; by cutting thinner ring blanks and gluing them together before starting the process, you can make multi-coloured wooden rings for men. Be creative and put a dark colour wood in the middle with two light coloured ones on the outsides or vice versa. Wooden rings for men can be as manly as any other male accessory if you wear it with pride. And there you have it! 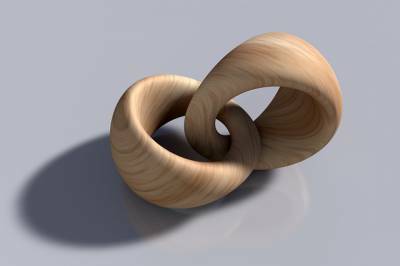 Making wooden rings is much simpler than you may have thought, but if you like the concept and lack the tools to make them, you can order one online at Wooden Rings & Co.